When we left off in Volume 6 we were staying at Grayson Highlands State Park. Well, we hiked, visited the ponies, biked the Virginia Creeper Trail again, and toured the area. As usual we had the park mostly to ourselves during the week. Wolf Creek, Burke’s Garden, and Crab Orchard. 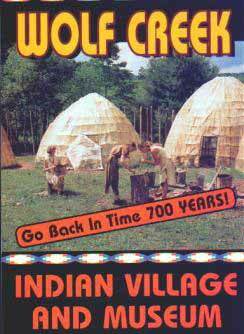 Wolf Creek is a village that was discovered in 1970. All that was found was the holes for the house poles and 14 graves. They have tried to recreate the village from the artifacts found and have interpreters who demonstrate what it was like there. These girls were “fleshing” hides from a beaver and a coyote. The animals are either road kill or from hunters. Doesn’t that look like fun? James Burke discovered this spectacular valley in 1742 while he was sewing on a survey team headed up by Colonel William Preston. It was by pure accident that an elk he was tracking lead him to this valley that the Indians referred to as The Great Swamp. Burke ventured back to the surveying party's camp and announced that he was sure that he had found the Garden of Eden "Blue Grass as tall as I did see", and "every kind of animal I know." Colonial Preston decided to look into Burke's claim and the party returned to ever I survey the mystical bowl Little did the know that winter started earlier in these mountains. They were forced by a storm to leave their task and while breaking camp Burke covered some potato peels in the brush and din of then campsite to keep from being tracked by Indians. They returned the following year to complete the survey. When the crew arrived at the previous years campsite, a lush potato patch had grown where the peels of the past were buried. The men laughed and joked about James' garden. That's right, Burkes Garden! Burke was promised 400 acres of choice" land for his find but history shows that he never was compensated as agreed. He eventually moved to North Carolina and was neighbor to another pioneer named Boone! 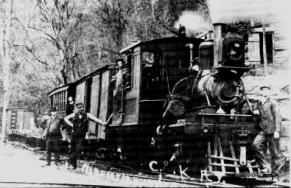 was the wealthiest railroad and timber baron in the United States in the late 1800's. As do most men, Mr. Vanderbilt had envisioned his dream home and began to search for the perfect place to build it. He sent out scouts to search the country for such a place and found it in the tiny community of Burke's Garden. Vanderbilt himself came to survey his possible future home and stayed at the Moss Farm in 1880. He requested the presence of several landowners so that he could make his bidding for this fertile soil. To his surprise and total dismay, the locals would not sell him a single acre. It's true to this day in Burke's Garden; some men cannot be bought! 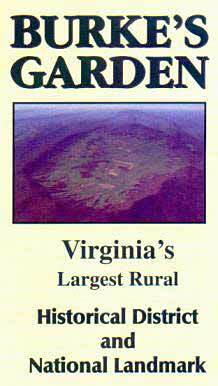 The majority of farmland in Burke's Garden is still owned by the same families or heirs from generations gone by. It is rare to this day that one would find acreage for sale so if that were a question in your mind, remember the Biltmore! Before we left Grayson we went to the Konnarock Fall Festival. Konnarock is a small town a few miles from the park in the middle of the National Forest. They were making apple butter and molasses and were serving “pit roast beef” dinners for $6. The locals had booths and were selling crafts, homemade canned goods, and baked goods. A slice of cake or pie was $1. They also had bluegrass and gospel bands playing all afternoon. All the farmers were square dancing and doing the two-step. We left Grayson on Oct 19th and headed back to Pennsylvania to visit Adele and John again. They let us stay in their meadow behind the house and plug into the electric at John’s workshop. We couldn’t see their house or the road from our spot. In the morning and evenings deer would graze in the orchard and eat the apples off the tree. The only other visitors we had were their two dogs that always wanted to play ball. We went hiking on the Finger Lakes Trail in New York. Plans were to full pack for three days. John however devised a plan where we wouldn’t need to carry the packs, but could park a car close to the shelter and leave everything there. After hiking 6 miles to the car it looked like rain so we decided to go to a local state park and camp there. We could then eat at a restaurant and shop for a bicycle for Adele. During the night it rained. We had waterproofed our tent and it didn’t leak… At 4 o’clock we awoke to about an inch of water in the tent. The top didn’t leak but the floor was old and rotten. We put on whatever dry clothes we had and moved to the car until morning (not much sleep). That was the end of the camping trip and the tent. While in Pennsylvania the furnace decided that it would work until it got cold in the middle of the night and then would not start until it warmed up. (We had frost one morning). It was raining and cold so we left a day early so we could stop in Altoona, Pa at an RV dealer there and get it repaired. They said that they were backed up for 1 month and couldn’t work us in. We bought the part that we thought it was and fixed it ourselves. The batteries in the motorhome were also getting old and weak so we replaced them while we were there and close to a Walmart. 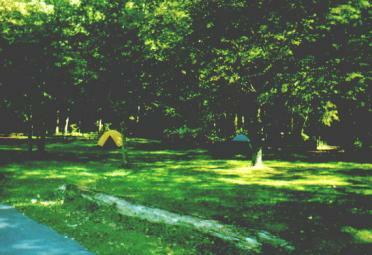 We stayed for one night at the campground that we liked so well when we were here before. 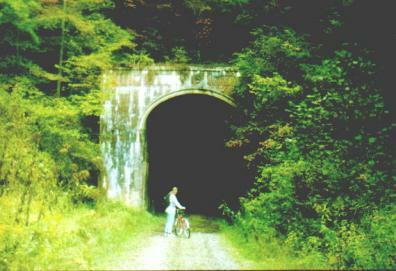 Next stop is North Bend State Park in West Virginia so that we can bike on the rail-trail there. The North Bend Rail Trail is a multipurpose recreational trail owned by the State of West Virginia and operated as a state park. Formerly an abandoned spur of the CSX system, the trail is also a part of the 5,500-mile coast-to-coast American Discovery Trail. Stretching 72 miles from 1-77 near Parkersburg in Wood County to Wolf Summit in Harrison County, this scenic trail passes by several quaint towns through 12 tunnels and crosses 32 bridges. Some sections of the trail from Walker to Parkersburg, purchased in the spring of 1996, are not yet developed or passable. Easily accessible from north-south Interstates 77 and 79, the trail nearly parallels US Route 50 east and west. The trail passes through wild and natural areas, farmland and a variety of small rural communities that grew up along its length. 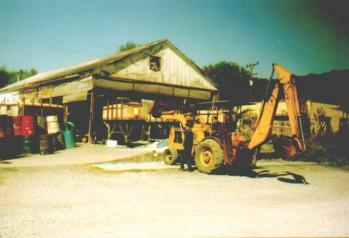 The many points of interest and history include the Old Stone House and the former stagecoach inn at Pennsboro, a marble factory, hand-blown glass factories,garment factories, outlet stores, arts and crafts markets, fairs and festivals, sites of train robberies and legends of tunnel ghosts. The trail also passes numerous state, county and local parks. 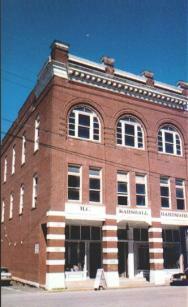 Development of the model section between Cairo and Cornwallis began in June 1991. Grade has been established and barricades have been constructed to prohibit access by motor vehicles. All bridges in this section have been railed and decked. Other sections are passable but not yet fully developed. These two pictures were taken at the haunted tunnel. 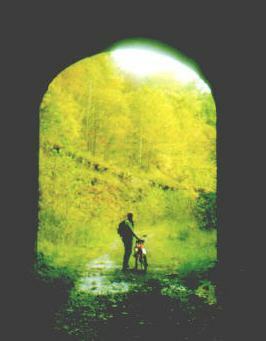 (It’s ¼ mile long and dark inside) A girl with black hair and a white dress would appear at this end of the tunnel. After the train would stop there would be no one there. One engineer got tired of this and just blew the whistle and did not stop. After he reached Parkersburg he was told that they had received reports of a girl riding the front of the train all along the route but no one was there. When they did some research they learned that there had been reports of a girl who was traveling to Parkersburg to get married years before but had disappeared without a trace. Maybe she got there after all. There is an interesting town along the trail called Cairo where we ate lunch and visited the hardware store. 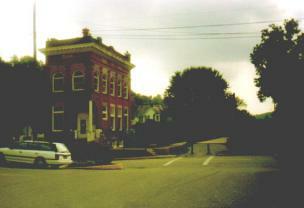 This is the bank building. They once had a wreck where the train hit the building. This hardware store still has the interior from the 1890’s and stocks all kinds of neat things. 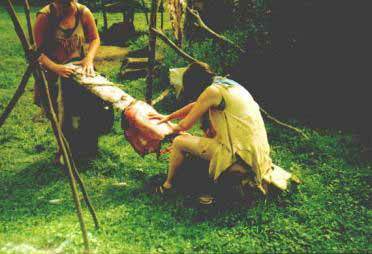 Bear skin rugs, cast iron cookware, oil lanterns, etc. Also the trail goes thru a glass factory where they make marbles and blown glass things like vases. The picture on the left is where they are making marbles. This is where they shovel in the glass scraps and it poops out the marbles inside the building. 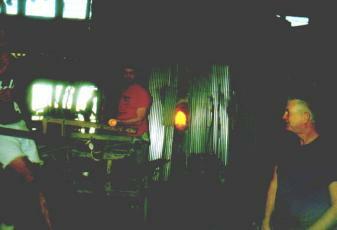 These guys are blowing some glass vases. 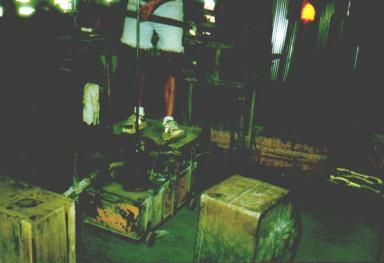 The one in the red shirt is preparing the glass for the blower in the white shorts while he is smoking a cigarette. The one in the blue shirt then carries the vase to an oven to be tempered. Must be a union job. Here he’s blowing the vase in a mold to shape it. That’s all for now. We’re headed to Watoga State Park in West Virginia to bike on the Greenbrier River Trail.